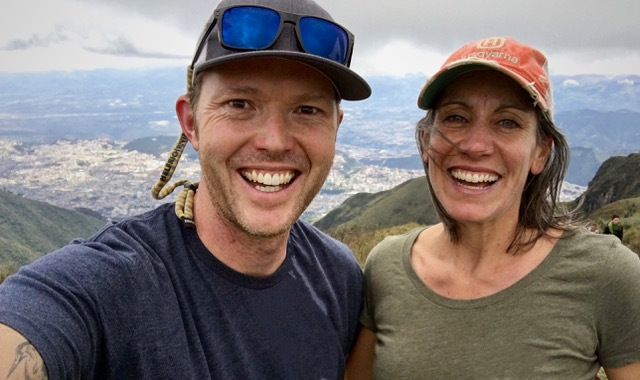 Katie and Jordan were first-time homebuyers, but they were already seasoned Airbnb hosts comfortably taking advantage of the sharing economy with space in their rental home. 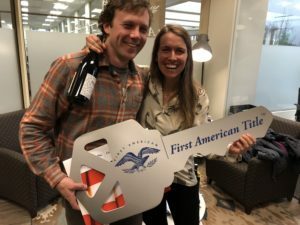 First and foremost as prospective homeowners, they wanted to find a single-family home that would also provide passive income and be a foundation for their future investment portfolio. They also wanted to be in a vibrant, walkable neighborhood with good cafes, bars, shops and restaurants in order to maximize their Airbnb rental rates. And as committed bike commuters, they wanted to be no more than thirty minutes from their respective offices in downtown Portland and the inner SE industrial district. My favorite step in the home-buying process is the initial meeting with my clients. This is when the process of team-building begins in earnest and it helps set the stage for the next weeks or months of working together. This meeting gives my clients a deeper look into who I am and how I approach my work, and provides me the ability to learn more about their personalities, their dynamic together and the most important things in a house and in the process. I love the freshness and possibilities that await. So I was already stoked for our first meeting, but it was especially sweet because it was on my birthday in early October. I’d met Katie before at an alumni event as we graduated from the same college, but we never sat down to chat in-depth and I hadn’t met her partner Jordan. As is fitting for those who are comfortable sharing their home, Katie and Jordan proved to be open-minded, easygoing and flexible, but also very analytical, thoughtful and asked lots of great questions. Those three major criteria were really helpful in developing a targeted property search – the ‘must haves’ – but they also had several other ‘nice to haves’, as well. 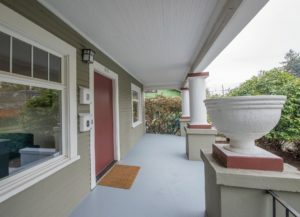 At the top of that list was a covered front porch and plenty of space for their bikes and their outdoor gear; others included an open floor plan between the kitchen and living space, no claw foot tubs, fenced yard for the future golden retriever, strong walkability factor, and good grill and chill space on a deck/patio. They got all of these things – and more – with a huge basement and tuck-under garage, on a corner lot, for even further future expansion/ADU potential. You *can* have it all, but you’ve got to keep the qualities of remaining grounded, curious, nimble and open-minded throughout the whole process in order to maximize your options. Katie and Jordan exhibited all of these qualities over the course of five weeks of explorations: complete fixer-upper homes, homes with basement conversion potential, and homes with already-converted spaces. Other than a handful of places (one for which they made an offer but got caught in an oddly-aggressive multiple bid situation), they weren’t finding anything that matched what they truly wanted. I suggested that they switch gears a bit to look at some duplex options. 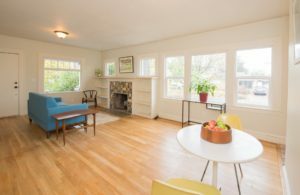 With a traditional duplex, Katie and Jordan were able to use the projected rents for the second unit towards their income ratios and were able to qualify for a higher loan that allowed them to pursue ‘more’ house like this one. Plus, a fully separate unit would provide them additional privacy and the flexibility of either short-term or long-term rental scenarios. Because of the flexibilities that duplexes offer, and the typically lower price points for the ‘amount’ of house you’re getting, they’re a great way to get to a first home faster – just a house that’s slightly more work as a landlord. 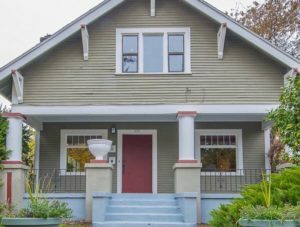 The result of Katie and Jordan’s efforts and dreams is this graceful 1922 beauty in the coveted Dekum Triangle area of the Woodlawn neighborhood — literally steps from Breakside Brewery, Woodlawn Coffee, The Firehouse and Woodlawn Park (some of my favorite spots in NE Portland). It has everything they clients needed, everything they wanted, and it has so much more potential for them in the future. Congrats, Katie and Jordan! And thanks for showing the best ways to stay grounded, remain curious, keep nimble and be open-minded as homebuyers. You just never know where your search might lead!